What Can Employers Do If OSHA Brings a Union Representative on an OSHA Inspection? Employers need to be aware of a new possibility that union representatives may attempt to accompany OSHA compliance officers during workplace inspections, including at workplaces where the union has not been elected to represent the employees. 29 U.S.C. § 657(e) of the OSH Act authorizes a “representative of the employer and a representative authorized by [the employer’s] employees” to accompany the OSHA agent during an inspection of the workplace. The OSH Act specifies that the purpose of including these representatives is to help OSHA conduct an effective workplace safety inspection. However, OSHA’s implementing regulations, specifically 29 C.F.R. § 1903.8(c), require that the employees’ representative must himself be an employee of the employer, unless the individual participation is “reasonably necessary to the conduct of an effective and thorough physical inspection of the workplace.” The regulation focuses on the third party’s technical expertise by listing “industrial hygienist [and] a safety engineer” as examples of non-employee representatives who may qualify under 29 C.F.R. § 1903.8(c). 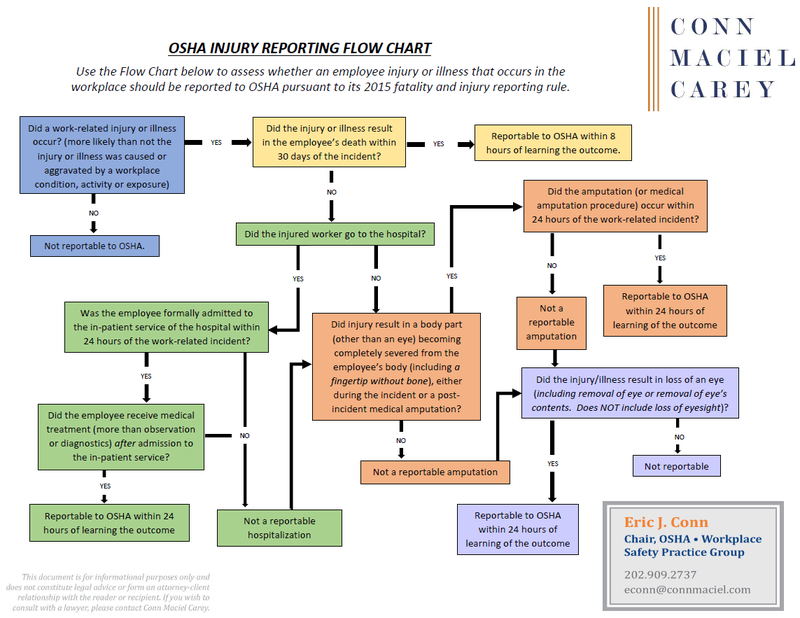 OSHA’s Field Operations Manual (FOM). Likewise, OSHA’s own Field Operations Manual and its predecessor, the Field Inspection Reference Manual, include a section about inspection representatives, and refer to “Employees Represented by a Certified or Authorized Bargaining Agent” and “Employees Represented by a Certified or Recognized Bargaining Agent” respectively. The FOM also instructs OSHA inspectors what to do in situations where there is “No Certified or Recognized Bargaining Agent,” and that is to determine whether other “employees” could represent the interests of their co-worker or to conduct interviews with a reasonable number of employees. Finally, OSHA’s FOM instructs inspectors to avoid inserting themselves into labor-management relations. Through this Interpretation Letter, OSHA has created an environment where that restraint may not be possible, especially since the new policy provides unions with unprecedented access to new workplaces and employees, possibly during an organizing campaign or even before. In addition to being a strained reading of the applicable regulation, and contradicting the NLRA, OSHRC regulations, and OSHA’s operations manual, the 2013 Interpretation Letter also appears to violate the Administrative Procedure Act. The Administrative Procedure Act requires agencies that are planning to change a rule to provide the public with adequate notice and an opportunity to comment on the rule change. OSHA did not do that here. The Agency changed this substantive rule by way of an Interpretation Letter without providing the public with any notice or opportunity for comment. After OSHA issued this interpretation, the employer community anxiously waited to see if and how OSHA and organized labor would change the landscape of OSHA inspections. The reality is, there have been very few attempts thus far by unions to join OSHA during inspections at non-union workplaces. We are aware, however, that in October and November of 2013, union representatives from Service Employees International Union attempted to accompany OSHA inspectors during inspection at three facilities under contract with Professional Janitorial Services, a non-union employer. We understand that the employer successfully excluded the union representatives from those inspections, following some of the steps outlined below. Obtain the third party’s identity, his employer or organization affiliation, and his intentions or purpose for participating in the inspection. Ask if, how, and how many employees or set of employees requested or selected the third party to represent during the inspection. Inquire of OSHA whether the third party has some special skill or background required to assist the inspector and what that might be. After getting this information, the local manager should ask the OSHA inspector to wait while the manager obtains direction from senior management or the company’s OSHA counsel how to proceed. Second, employers should consent to the OSHA inspection (unless there is some reason to refuse the inspection in general), but should decline to allow any non-OSHA representative, especially a union representative at a non-union site, from entering the premises and participating in the OSHA inspection. Make it clear that you are not refusing OSHA’s request to inspect the workplace, but you are exercising your rights as property owners to exclude uninvited third parties with no governmental purpose. OSHA will then have to choose between: (a) proceeding with the inspection without the union representative; or (b) going to a federal district court to seek a warrant to proceed with the union representative in tow. The employer can wait to see whether OSHA initiates a contempt of warrant proceeding, a process by which OSHA tries to enforce the warrant by order (and possible sanctions) of the district court, and if OSHA does, then the employer appears to defend itself in that proceeding by arguing that the warrant is invalid for the reasons summarized above. Since union representatives have started accompanying OSHA agents to inspections, employers need to make their managers aware of this possibility and prepare them how to respond. It is very important for employers to take control of the situation before the inspection begins. For more tips about preparing for and managing OSHA inspections, check out the OSHA Inspection Toolkit, prepared by Conn Maciel Carey’s national OSHA Practice Group to help our clients and friends navigate through the OSHA inspection maze. Likewise, here is a link to a recording of a webinar we conducted about “Preparing for and Managing OSHA Inspections” as part of Conn Maciel Carey’s 2015 OSHA Webinar Series.